Medea is a thrilling role that finds Eaglen handling Mayr’s intricate vocal writing with aplomb. The British Soprano Jane Eaglen has been hailed in Europe and America as a great Wagnerian specialist. Here she does a complete stylistic turnaround, displaying the full force of her impressive bel canto skills. Medea is a thrilling role that finds Eaglen handling Mayr’s intricate vocal writing with aplomb. 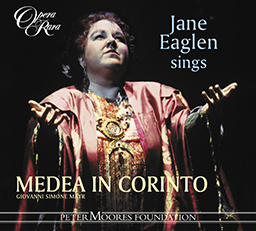 This disc contains all of Medea’s music, including the great Invocation Scene in which she summons the Furies with the dramatic tones of Wagner’s Isolde. 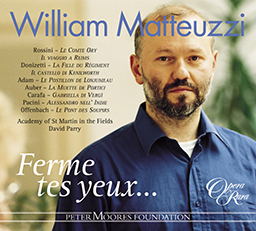 There’s strong support from Bruce Ford, Raul Giménez, Yvonne Kenny and Alastair Miles in this 1993 recording. 05 Medea in Corinto: Act I: scena: Cara figlia! Prence amato! 07 Medea in Corinto: Act II: Invocation scena: Dove mi guidi? 09 Medea in Corinto: Act II: scena: Ma qual fioco rumor! 11 Medea in Corinto: Act II: scena: Ismene ? o cara Ismene! 12 Medea in Corinto: Act II: Aria: Ah! Che tento? 13 Medea in Corinto: Act II: scena: Quale orror mi comprende!